Exactly three years to the day from the fire that destroyed one of the University of Southampton's leading research facilities, the imposing building that has taken its place is now open to students and staff. The new Mountbatten Building on the Highfield Campus occupies the same footprint as its predecessor, and is a substantial architectural triumph. The £55M building is also one of Europe's leading multidisciplinary and state-of-the-art clean room complexes. 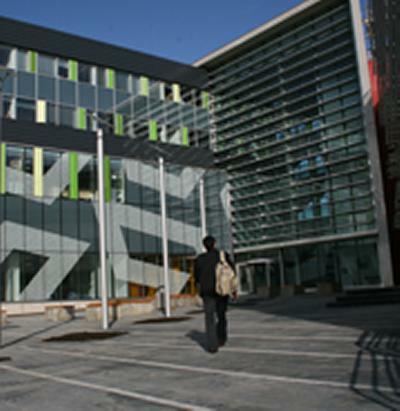 It provides flexible research space for world-leading technology development in nanotechnology and photonics for the University's School of Electronics and Computer Science and the Optoelectronics Research Centre. Both inside and outside, with its laboratories, teaching space, and impressively spacious atrium, the Mountbatten Building makes a statement. The design is bold and modern, the building's glass curtain walls - graced by a mathematical fractal pattern - enable those outside to view the research taking place in the clean rooms. "The new building has literally risen like a phoenix from the ashes of its predecessor," said Professor Harvey Rutt, Head of the School of Electronics and Computer Science. "It provides the environment and facilities that will enable us to carry out fundamental and transformative research at the nanoscale and our cleanrooms will enable us to forge new partnerships with others working at the leading edge of technology. It fully realizes the University's commitment made the day after the fire, to ensure that our research would continue in even better and more appropriate surroundings." "On behalf of the ORC, I am very excited at the prospect of getting our laboratories back after three years of making-do in temporary facilities," said Professor David Payne, Director of the Optoelectronics Research Centre. "This magnificent clean room building is unique and world leading in its imaginative vision for the integration of nanoscience, photonics and optical fibre technology. With the devastating fire well and truly behind us, we can now rapidly rebuild our reputation as the foremost photonics centre in the world." The day following the fire, the University's Vice-Chancellor Bill Wakeham had promised that: "We are committed to rebuilding, and that out of these tragic events will emerge something bigger and better." Today Professor Wakeham commented that: "We have been able to fulfil my promise made three years ago. Staff and students are starting to move in to this stunning new facility and I look forward to seeing the positive impact that this will have on their world-leading research." 1. The architectural and engineering team for the Mountbatten Building comprised Jestico + Whiles, CH2MHill IDC and Gifford. The project manager was WYH Trench Farrow and the main contractor was Bovis Lend Lease. 2. The new Mountbatten Building shares the name of its predecessor on the same site. The original building opened in 1992, bearing the name of Earl Mountbatten of Burma, a Past-President of the Institution of Electrical Engineering, whose papers had recently been given on loan to the University's Hartley Library. 4. The building's striking appearance provides a highly visual clue to its purpose. The clean rooms and laboratories which occupy the two lower floors are characterized by the Peano-Gosper fractal etched on the glass panels which enclose the building. The fractal was used in research undertaken by Professor Darren Bagnall and Dr Adrian Potts of ECS and Professor Nikolay Zheludev of the Optoelectronics Research Centre. 5. With around 500 researchers, and 900 undergraduate students, the School of Electronics and Computer Science at Southampton is one of the world's largest and most successful integrated research groupings, covering Computer Science, Software Engineering, Electronics, and Electrical Engineering. ECS has unrivalled depth and breadth of expertise in world-leading research, new developments and their applications. 5. The Optoelectronics Research Centre (ORC) has played a leading role in optics and continues to be at the forefront of photonics advances today. The ORC provided key components that enabled the communications revolution of the late 20th century. 7. The University of Southampton is a leading UK teaching and research institution with a global reputation for leading-edge research and scholarship across a wide range of subjects in engineering, science, social sciences, health and humanities.